After nearly 60 years of charitable commitment to the communities it serves, Jack’s is launching its own non-profit foundation ­– the Jack’s Family Fund. 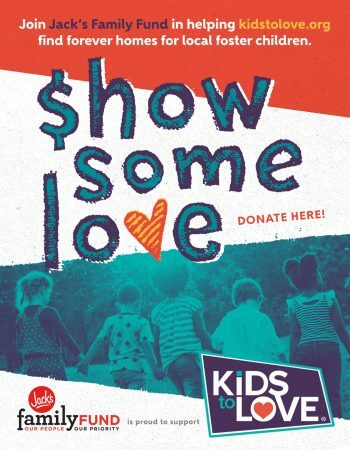 Kids to Love, a Huntsville-based non-profit providing homes to foster children, will partner with the new organization for its first official fundraiser across all 153 restaurants. The fund was established to provide a financial safety net during emergencies and crisis for employees, guests and communities across the restaurant chain’s footprint of Alabama, Mississippi, Georgia and Tennessee. It was launched with starter funds provided by Jack’s and its employees. Kids to Love’s reach mirrors the Jack’s restaurant footprint helping foster children to find their forever homes and providing needs like food, clothing and shelter along their journey. Donations to the Kids to Love fundraiser will be accepted at all restaurants from August 8- September 25. All funds donated will go directly toward assisting foster children as they prepare for forever families and the Kids to Love girls’ home, Davidson Farms. How: No purchase necessary, simply donate at restaurant registers or online here.